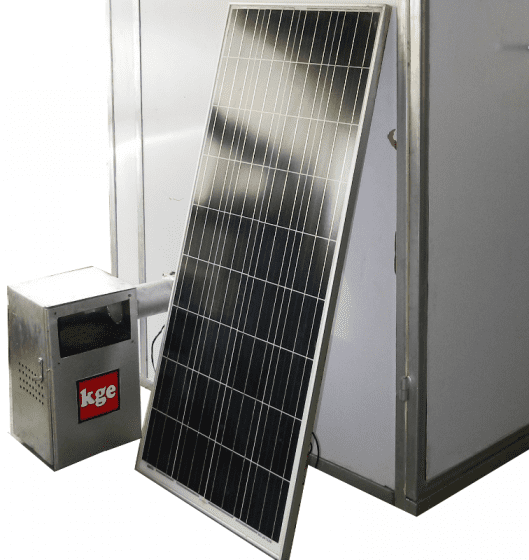 The KGE solar power arrangement enables you to run your chicken egg incubator when the national grid is not available or when your generating plant malfunctions. It features a 150W solar power system with the polymer type solar panels. Each KGE solar power arrangement with a carrying capacity of 150w is capable of supporting a 2,880 eggs capacity incubator. For bigger sizes of egg incubator, you will need multiples of this unit. The KGE solar power arrangement is a requirement for the incubator to function off the national grid. This setup/arrangement is exclusively recommended for use on the specified KGE incubators alone, thus additional loads are discouraged. For more information on our products, please use the Contact Seller button to contact us directly. You may have to register and log in. We make sure you get your products exactly as we describe them here or as we later agree. All our products come with one year warranty as well as availability of our staff for servicing, training and related support. If you are not satisfied with our product, kindly send us a message before leaving a negative feedback. We work hard to ensure you are completely satisfied with our products. All items ordered are shipped to Afrimash first for authentification and verification before being delivered to the buyers. We guarantee you of "zero risk purchase" experience in our shop and we do our best to ensure every customer is very satisfied with our products. Thus, we ensure you get exactly what you ordered for and swift delivery within the stipulated shipping/delivery duration. As delivery times are estimates and not guaranteed, delays in deliveries could be affected by weather-related delays or events outside our control, however, we always inform the customers in due time. 1. Kindly be informed that we do not accept returns or exchanges unless the supplied items are defective. For defective items, we accept notification within 24 hours of confirmed delivery and reception. Once we are contacted and informed of the defects, we will review the evidence then proceed with the approval of return as well as options for a refund. 2. If you ordered for a specific product delivered in good condition, such products are not eligible for returns. 3. We do not accept returns if you received the specific products you ordered for. Such cases will involve you placing subsequent orders for the other products without an option for return of previously ordered products or refund of payment. Thus, we advise our customers to review the product information pages, pictures and contact the listed customer care numbers for more inquiries for further clarification. Ground Floor, Freedom House (Beside PHCN Office), General Gas, Akobo, Ibadan 200103, Oyo State, Nigeria. ©2019 WoculusandAfrimash Investments Limited. All rights reserved.